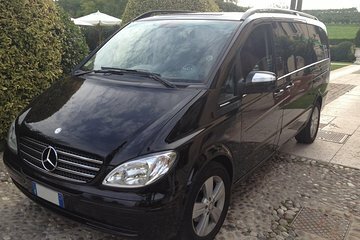 End your Florence trip on a high note with a stress-free shared departure transfer from your hotel in Florence to the Florence Airport. Reserve your pick-up time, choosing from a selection of departures to fit your schedule, and your experienced driver will pick you up right at your hotel for a relaxed and comfortable ride to the airport in an air-conditioned vehicle. Reserve as suas necessidades de transporte do aeroporto com antecedência, dando-lhe uma coisa a menos para pensar durante as suas férias em Florença, e terá uma viagem fácil do seu hotel para o Aeroporto de Florença. Encontre seu motorista em seu hotel no horário programado que você escolheu e, em seguida, relaxe em um confortável serviço de traslado com ar condicionado para a viagem diretamente para o Aeroporto de Florença. Ao reservar sua transferência de partida, você precisará fornecer informações sobre seu voo e seu hotel em Florença. A confirmação acontece imediatamente e você receberá um comprovante de viagem como prova. 24 a 48 horas antes da sua partida, você precisará confirmar novamente os detalhes da localização e horário de embarque com o número de telefone incluído no seu voucher de viagem. Por favor, consulte a lista de hotéis em Florença que são cobertos por este serviço de pick-up, clicando no link "Ver informações adicionais" abaixo. Motorista pontual, atencioso e simpático. Recomendo é pontual e carro confortável e climatizado. Muito pontual e a van era excelente !!! Well mine ended up being solo transfer, which was fine by me. But my driver arrived on time, a bit early even and was super efficient to the airport in no time. I called the office earlier to ensure my pick up and all was sorted easily. Shuttle was right on time. As this is a shared shuttle, you might reach airport very early. Was on time, good car, nice driver, hotel pickup. Had to confirm 24 hrs prior the pickup, around two times more than a taxi fare. This service was ordered 31 days in advance However, they showed up at the exact time scheduled without any reconfirmation. Would use it again, even though I felt it was a bit pricey for one person. The service was excellent. Our flight was 45 minutes late so they left without us. When I called, they asked us to wait an hour. The cab ride was 22 euros and we were in our hotel in 15 minutes. I left my phone in the cab but was notified that it will be returned. Excellent service and outstanding honesty. Thank you.